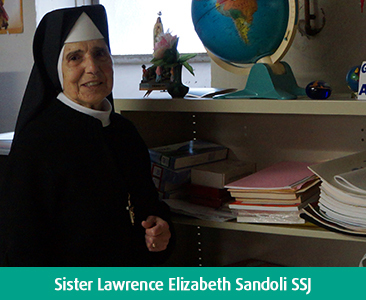 Sister Lawrence Elizabeth Sandoli SSJ has served in the ministry of education for over 55 years. Twenty of those years were spent as principal of Stella Maris Catholic School in South Philadelphia, which closed in 2010. At the same time, a need for ESL (English as a Second Language) at that location became apparent. With her usual enthusiasm and energy, Sister Lawrence was very much interested in this possibility and ready for the challenge. Click here to read more about Sister Lawrence.